Superbowl MVP Tom Brady celebrates after the win. Superbowl LI, the biggest sporting event of the year, was a roller coaster of emotions for both New England Patriots and Atlanta Falcon fans. Patriots rallied for 25 points and came back from a 28-3 Falcon lead. Patriots went for 75 yards on eight plays, and it was a two yard touchdown run in overtime that earned them their fifth Superbowl title. Superbowl LI was the first ever Super Bowl game, out of 50 previous, to go into overtime. The 34-28 win marks the fifth time the Vince Lombardi Trophy has been in the hands of the New England Patriots. Atlanta dominated the entire first half. They were up 21-3 at halftime, and it looked like the Falcons were going to come away with the easy victory. “I feel bad for the people who that stopped paying attention to the game,” stated Atlanta fan Zach Navarro. “The game is never over until the final whistle,” added Navarro. At halftime it was Lady Gaga’s turn to take the field. She performed her top hits and even jumped off the roof of NRG Stadium. There were hundreds of drones flying behind her, and they all came together and formed the American Flag in the sky. When the game resumed, a Falcons fumble with just eight minutes left in the third quarter sparked the comeback for the Patriots. The Patriots did not let this possession go to waste. They came back with a touchdown and completed a two point conversion to tighten the score, 28-20. A spectacular catch by Falcon wide receiver Julio Jones, left the clock running and put the Falcons in good position to pull away yet again. With just three minutes left in the game, the Falcons could not reach the end zone and were forced to punt because of an incomplete pass and a sack that put them out of field goal range. Another spectacular layout catch, this time by the Patriots wide receiver, Julian Edelman, brought the Patriots closer to the end zone. They scored the touchdown and completed another two point conversion with under a minute left to tie the game at 28 and take it to overtime. The Patriots had possession of the ball to start the sudden-death overtime period. They kept their momentum and Atlanta’s defense could not stop them. It was New England running back James White’s two yard run that left Atlanta fans speechless. “I knew Tom Brady would come through, he doesn’t go down without a fight,” stated Ariel Manzano. With 42 out of 63 passes completed for 466 yards, Patriots quarterback Tom Brady was selected to be the Superbowl MVP. 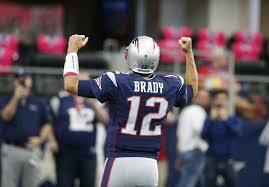 Brady surpasses former San Francisco 49er Joe Montana with five super bowl wins over Montana’s four.